More than 500 species of brightly colored fish called cichlids live in east Africa's Lake Victoria. Most of these fish cannot be found in any other lakes in the world. They have evolved a dizzying variety of roles: insect eaters, leaf choppers, snail crushers and scale scrapers, to name a few. In 1996, geologist Tom Johnson from the University of Minnesota, Duluth, and colleagues reported in Science that Lake Victoria and its satellite lakes dried out completely during the late Pleistocene, about 12,400 years ago. They concluded that the vast array of cichlids must have evolved from a few ancestors in the time since the desiccation -- making cichlid evolution the fastest on record for any vertebrate, by many fold. A paper in the April 11 Science puts the brakes on this rate of evolution. Evidence locked in the DNA of Lake Victoria's cichlids indicates that the first burst of speciation began 100,000 years ago, and that the fish have been evolving since. And, the authors say, the original set of founding species may have itself been diverse, kick-starting the evolutionary radiation that followed. "If you start out 10 times longer ago, with fish that were already diversified, the [cichlid radiation] is easier to imagine," says lead author Erik Verheyen, an evolutionary biologist at the Royal Belgian Institute of Natural Sciences in Brussels. According to the April Science study, cichlids from Lake Kivu (marked LK) colonized Lake Victoria (LV), setting the stage for the rapid evolution of over 500 endemic cichlid species. No waterways currently connect the two lakes, although the authors suspect that ancient rivers did. Photo courtesy of NASA. The study presents a new example of how geology and evolutionary biology can lead to different conclusions. "The contrast between geophysical and molecular evidence is absolutely fascinating," Johnson says. Lake Victoria sits between two branches of the major rift that runs through east Africa. Approximately 400,000 years ago, the eastern flank of the western branch lifted up, causing rivers that had been flowing east to west to reverse direction. Water ponded, forming the lake. 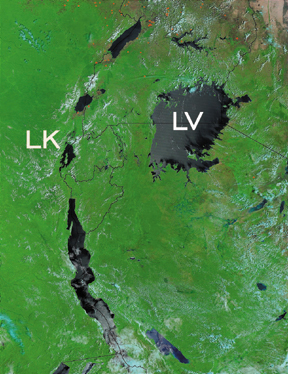 In 1995, Johnson's team surveyed Lake Victoria's sediments in the hopes of finding a continuous record of changes in regional climate since the lake formed. They used seismic profiling to look for sediments with fairly uniform reflectivity down many tens of meters. Such a profile would indicate that the sediments accumulated gradually at the bottom of the lake, without any interruption. But the actual profiles revealed a jump in reflectivity about seven meters beneath the sediment surface. The team's seismic tracks crisscrossed the lake, always with the same result. Piston cores that grabbed segments of this highly reflective layer allowed for a closer look. The segments crumbled easily, were much thicker than the sediments above, and were filled with vertical roots and pollen grains from cattails -- all signs that the sediment formed beneath air, not water, and that the lake was at one time not a lake, but a vast marsh, Johnson says. Carbon dating pinned the age of the ancient marsh to approximately 12,400 years old. While the seismic surveys and piston cores did not extensively sample the whole lake, the basin bottom is so flat that the entire lake must have dried out when the water level dropped, the authors argued in the 1996 Science paper. They concluded that cichlids would not have been able to find any large or deep refuge in which to wait out the dry spell; few would have survived. Previous phylogenetic studies had indicated that all of Lake Victoria's cichlids evolved from a single ancestor. Only one possibility remained, Johnson says: most of the 500 species found in the lake today evolved in the past 12,400 years. In 2000, Sandra Nagl, a molecular biologist from the Max-Planck Institute for Biology in Germany, presented a different view, based on DNA sequences from Lake Victoria cichlids. Fish that belong to the same species tend to have similar DNA, especially in stretches sitting in what is called the mitochondrial control region. When one species evolves into two, random mutations in the DNA slowly cause the control regions of the two new species to diverge from one another. The greater the divergence, the longer ago the two species split. From such molecular data, Nagl concluded that the Lake Victoria cichlids began to evolve 100,000 to 200,000 years ago, not 12,400. At the heart of these calculations is what is known as a molecular clock: an estimate of the amount of time that elapses before a single difference in the DNA code between two species emerges. Nagl's group assumed a ticking rate of about a 5.6 percent divergence in DNA sequence every million years. The authors of the April Science article made their own molecular clock calculations, coming to the same conclusion that the Lake Victoria cichlids began evolving about 100,000 years ago. The study also finds another factor that slows the rate of evolution, Verheyen says: the species that began the Lake Victoria radiation were themselves quite diverse, limiting the degree of speciation needed to happen afterward to explain today's diversity. From the DNA data, the authors constructed lineages showing the relationships between the cichlids in Lake Victoria and surrounding lakes. They discovered that two genetically distinct classes of fish from nearby Lake Kivu colonized Lake Victoria. Until now, many evolutionary biologists believed that Lake Victoria's cichlids evolved from a single species. It is not clear how much diversity -- in terms of size, shape, color and behavior -- the initial two classes of cichlids encompassed, although it may have been great, Verheyen says. Today, just one of those genetic classes includes cichlids that graze on algae, others that eat insects, and still others that eat fish. The two perspectives may have common ground. Even a few lingering ponds in a mostly desiccated lake could have provided strongholds for cichlids that hunkered down until the rains came, Verheyen says. That scenario is possible, Johnson acknowledges: "There was no big deep water lake there. At best there could have been a cattails swamp with a few ponds." On the flip side, the DNA-based lineages indicate that several genetically distinct groups of fish that appear not to live in the lake now must have, at one point, existed. Perhaps the dessication eliminated these species, the authors say. 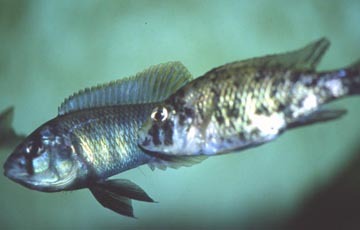 Johnson, however, argues that the molecular clock used to date the cichlid evolution could be flawed. Robert Schelly, a graduate student at Columbia University who is studying cichlid evolution for his dissertation, agrees. "You have variation in the rates of molecular evolution among different loci and different species," he says. The molecular clock applied to Lake Victoria, he notes, was calibrated using a different set of cichlid species living in nearby lakes. Even if the new Science study turns out to be correct, the rate of cichlid evolution is still astonishing, says co-author Axel Meyer, an evolutionary biologist at the University of Konstanz, Germany. Whether it is 12,400 years or 100,000 years, cichlids will still hold the record for the fastest known evolution of vertebrates. IDEAL Highlights earth science research done through the International Decade of the East African Lakes program. Overview of the geology and geography of the Great Rift Valley. Molecular laboratory, Royal Belgian Institute of Natural Sciences.